I would definitely recommend ABC Humane. ABC humane wildlife did a very good job. The men worked really hard. Tony was very good at communicating with me. Also good follow up. Staff were courteous and prompt and kept me informed about the progress of the work. Fully satisfied. Professional,punctual and quick service. Amazing service by the entire team. We had raccoons causing dormer damage. Captured three raccoons quickly and repaired and reinforced the entry areas. Met many team members and all were very friendly and capable. Highly recommend this company. we were very pleased with the service and would recommend to others thank you very much. Excellent service. Very professional, yet friendly service! Highly recommend! Very professional, thorough and knowledgable. The $75 per visit is too expensive though. I would recommend a total of $75 for all visits. Extremely nice people to deal with. Reasonable rate and thorough visits. All visits were accomplished in the timeframe that the reps said they would arrive. Great people / great service. Both me and my husband commented on multiple occasions throughout the process that your customer service was impeccable. Thank you! Very knowledgeable and professional. Super easy to work with and coordinate service. Highly recommend! wondrful employees both in office and in person. Prompt service by their technicians. animal was trapped within 24 hours. Very well Am very pleased. ABC Wildlife is extremely professional and their customer service is exceptional. Everyone is polite, helpful, and eager to please. Very pleased with the service. Tech came out the next day, called me with a window of when he would be at my house and when he arrived, he did a very professional job. I would highly recommend ABC. Caught the skunk that was tearing up our lawn. We had to rebait and reset the trap twice, but it gave us a sense of participation! The video provided by ABC was all we needed. A little pricey, but worth it, since Animal Control said we’d need to be licensed by DNR to trap and that Animal Control wouldn’t come around to dispose of anything we caught. It’s a nasty job, but someone (thankfully not me) has to do it. I’d pay the price again. All’s well that ends well. Reps are super courteous and knowledgeable. Fast and friendly service - same day, in fact. Thanks for helping us with our skunk problem. I contacted ABC on Wednesday 10/17. The appointment was scheduled for the next day, Thursday, 10/18 and a trap was baited and set. I contacted ABC Friday, 10/19 at 7:30 to inform them that something was in the trap. It turned out to be a racoon. The trap was rebaited and set; it remained empty and was removed 8 days later on Saturday, 10/27. There is a guarantee of ABC returning within 7 days should the need arise. Great job. They trapped the skunk and removed it. Everyone was very pleasant to work with and did a good job. My only complaint is that I had to wait too long to have the fan cover put on and then scheduling the cleanup was a long wait also. The service was good and timely and helped us get rid of several skunks that were making our backyard tough to use. Only downside is that ABC wouldn't allow me to release accidental catches on my own, even though I've pest trapped for years - which makes it a bit more expensive than I would have liked (only because of those extra trips to release animals). You do an excellent job — and are easy to work with. We were pleased with the work and pleased with those who did the work. 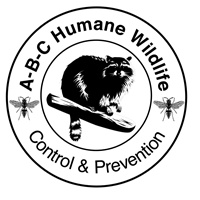 ABC Humane Wildlife, as a company was great to work with. The phone staff was nice, they scheduled everything and showed up when they said. Kudos! The technician, Nick Howe, was very thorough and diligently professional. He is a real asset to the ABC team. Answered my questions, and just did the job right. Very efficient, professional, nice people. Great service along with fantastic guidance and arrangements done by Andi and everyone at ABC Wildlife - whenever I have a query or guidance needed. ABC was very responsive and professional. They explained the process completely and communicated each step to me so I was aware of what was going on. Phone and email communication were top notch! Thanks! Very efficient, friendly, and neat. Could not be more pleased. Will definitely recommend you to others. Though our skunk problem turned out to be a ground hog problem ABC Humane Wildlife remained honest to the terms of the contract. A new offer to resolve our wildlife problem was reasonable but we agreed to discontinue service due to other considerations. Technicians were knowledgeable, proficient and friendly. Very happy with the service from start to finish. Everyone we dealt with was great. They showed up when they said they would, and did their work quickly, politely and without any mess. Would use again, but hope I never have to. ABC Wildlife did a great job with getting rid of some bats in my attic and then cleaning up, disinfecting and putting in new insulation! ABC works quickly and also makes sure that floors and carpet are protected so when the bring equipment in and out our house stayed clean. I would highly recommend this company if you have any type of critter issue. The service has been fine. The service which I requested was done to my satisfaction. We have been extremely pleased with ABC Wildlife in ridding our attic of bats. They have been informative in the process in telling us what would happen and when the work would be done. The crew that did the cleanup and removal and installation of the insulation were very punctual and courteous. They also did a great job of cleaning up each day and at the end of the process.